Hughes Springs, Texas and Trammell’s Treasure. More than 300 miles inland from the Gulf of Mexico, the community of Hughes Springs owes its existence to a fanciful pirate story and one man who believed it. Born in Tennessee and raised in Alabama, Reece Hughes first saw Texas in 1829 when he crossed the Sabine to hunt buffalo. The expedition proved short-lived. “This little band of adventurers was soon driven out of Texas by a much larger force of hostile Indians,” son Howell Rose Hughes wrote a century later. Nine years later after his first visit, Texas having wrested its independence from Mexico, Reece Hughes returned with his younger brother. They settled in Red River County, but an intriguing tale Hughes had heard on his first trip to Texas lured him to what is now Cass County. As his son remembered it, “an old sea pirate who bore the name of Trammell” had buried “a great stong box of gold coins” near an Indian village on the trail that later bore his name – the Trammell Trace. Others gilded the legend, claiming Trammell had once been a member of Jean Laffite’s not-always-jolly band of saltwater brigands. After Laffite got run off Galveston Island by the U.S. Navy, the tale continued, Trammell decamped for St. Louis with his share of the loot. Hounded by hostile Indians while on the way to Missouri, he buried his treasure in Northeast Texas. Hughes and his brother set out to find Trammell’s treasure, following the trail to an old Indian village along a mineral rich spring-feed creek in a handsome valley about a mile east of present Hughes Springs. On March 28, 1839 they pitched a tent and started chopping trees for a log cabin about a mile from the spring. 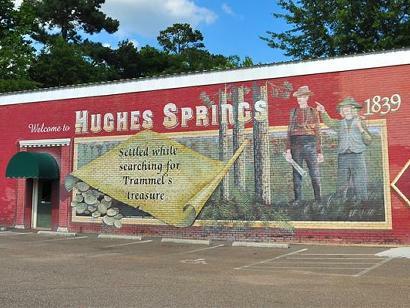 Hughes Springs mural: "Settle while searching for Trammel's treasure"
Nicholas Trammell, the reputed pirate who played an unintended role in the beginning of Hughes Springs, certainly would have understood another fellow’s desire to live prosperously. A Tennesseean like Hughes, Trammell had migrated westward to Arkansas as a young man. After working as a French and Indian interpretor for a time, he settled on the White River and began selling salt. Coming from a family of traders and trail-blazers, Trammell in 1819 began cutting a trail from the early-day Texas community of Jonesborough on the Red River to Nacogdoches. Soon he relocated to that town in the pine trees along the Camino Real, the old Spanish road from Louisiana to South Texas. While nothing in his still-sketchy biography suggests he ever participated in piracy on the high seas or buried treasure in East Texas, Trammell fell a bit short of “Citizen of the Year” status. As the late artist-historian Jack Jackson pointed out in Trammel’s “Handbook of Texas” entry, the pathfinder was about as good at finding trouble as blazing new trails. A fondness for horse racing led to difficulties over unpaid wagers and Trammell occasionally stood accused of slave and horse thievery. Jackson theorized that on his way south to Mexico, Trammell must have passed through the Guadalupe River valley and liked what he saw. 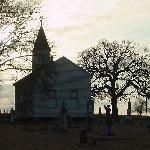 When the war ended and Texas’ status as the 28th U.S. state had been assured, Trammell moved his family to Gonzales County and remained until his death in 1856. About the time Trammell had marched off to war, Hughes – by then a wealthy planter – founded a town he named after the springs named for him. Hughes Springs did well for a time as people came to enjoy the supposed curative value of the mineral water bubbling up from below, but by the mid-1870s, its economy wrecked by the Civil War, the pace had slowed considerably. A new townsite came with the arrival of a rail line in 1878, but Hughes Springs has remained just a small, pleasant East Texas town, a place built on one man’s lust for pirate gold and another man’s less-than-golden reputation.